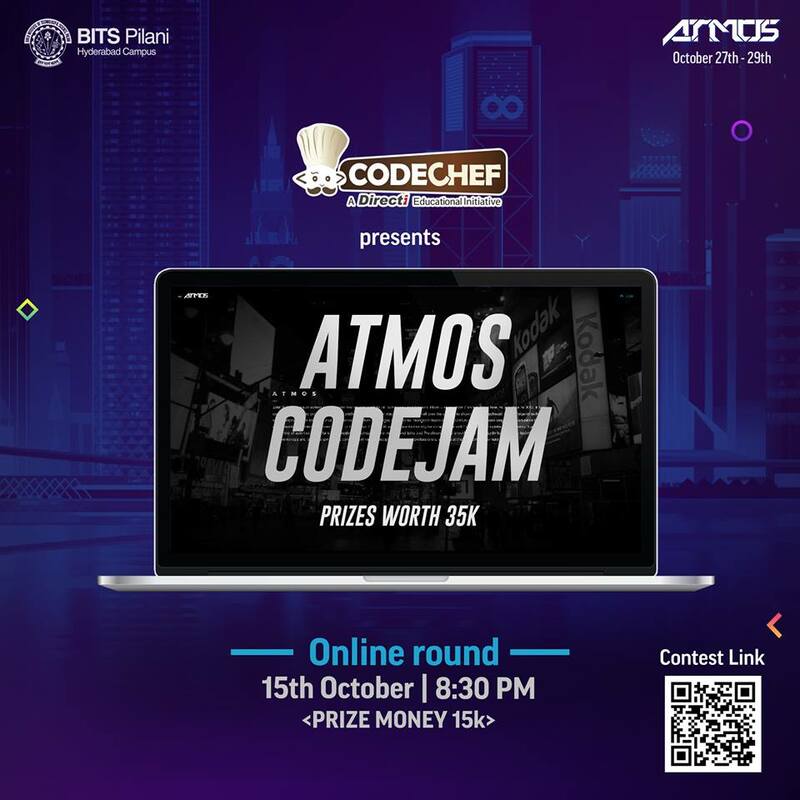 Organiser: The contest is hosted by BITS Pilani Hyderabad Campus. Registrations for prizes: Please fill this form to be eligible for prizes. Do register yourself at ATMOS webiste. Top 3 participants will be eligible to receive the prize money. Top 25 participants from this round will be selected in the Final On-site Round during ATMOS. Top 15 participants will be eligible for free Accommodation and their Registration Fees will be waived. The contest will be held in BITS Pilani Hyderabad Campus on 28th October and will be 3 hours long. Top 3 participants will be eligible to recieve the prize money. Note: On-site presence is necessary to claim the cash prizes for both online and on-site rounds. In case an eligible candidate is not present to accept the prize/perks of the online round, the next available candidate on the rank-list will avail the same. Please contact crux@hyderabad.bits-pilani.ac.in for any queries during the contest. Post-contest announcement: All submissions for Office Play have been re-evaluated due to mid-contest removal of test cases to eliminate submission queue. The final ranklist has been updated. *NOTE*: Contest submissions have been disabled for 15 minutes to deal with the queue. The contest is being further extended by 30 minutes due to the queues, and will now end at 23:30 pm IST. Contest has been extended by 30 minutes due to problem in sample I/O of "Office Play". Sample Input for "Office Play" was wrong. We apologise for the inconvenience. The input/output has been updated. Sample Input Output for "Office Play" has been updated. It has 2 queries (not 1 as initially stated).